My only question is shouldn't WIND be placed outside the Earth's magnetosphere as it orbits the Sun-Earth L1 point with ACE & SOHO? 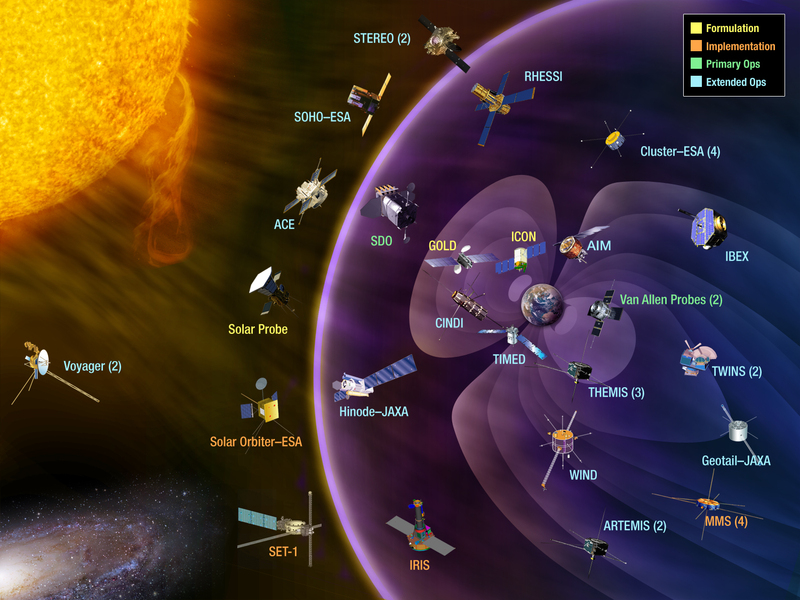 I find the way satellites are placed in this image very confusing as well. I think it hints at a general placement but anyone taking this depiction as literal truth (ie most folks in the general public) will have a very confused idea about what is going on. Same for the inclusion of the galaxy in bottom left corner. If one assumes placement corresponds to the 'region' it occupies, then the Voyagers placed between the Sun and galaxy sort of works. But then we have IRIS, Hinode, etc. which are sun-observers and in near-Earth orbit, positioned near the magnetopause. It can be tricky to interpret unless you explicity state the organizational theme. Is the icon position related to what they observe, or where they are located? Or a mish-mash of both? It is still a useful quick reference for what is still operating and what is under development.